I believe that you can tell a lot about a society by the importance that they place on the arts. I’ve sometimes been amazed and disheartened to find that in some cities, it was all but impossible to find a museum, a gallery, or a performance venue. Those places always seem somehow empty to me, as if something essential were missing, some critical part of the city’s soul. September 2017, single image, additional exposures for highlights, focal length 16mm, aperture f/8, shutter speed 121 seconds, ISO 64, ND 10-stop filter, tripod. In other cities, the arts are given a prominent place, signaling to anyone who enters that the artistic life of the city is just as essential to the well-being of its people as the world of business and commerce. I find that I feel more at home in those places, I feel that I am among kindred spirits. Copenhagen is one of those places. The arts aren’t tucked away in Copenhagen; they’re a vital part of the life of the city. The city is full of museums, galleries, and theaters. It occurs to me, thinking of the well-known happiness of the Danes, that perhaps the two are related. 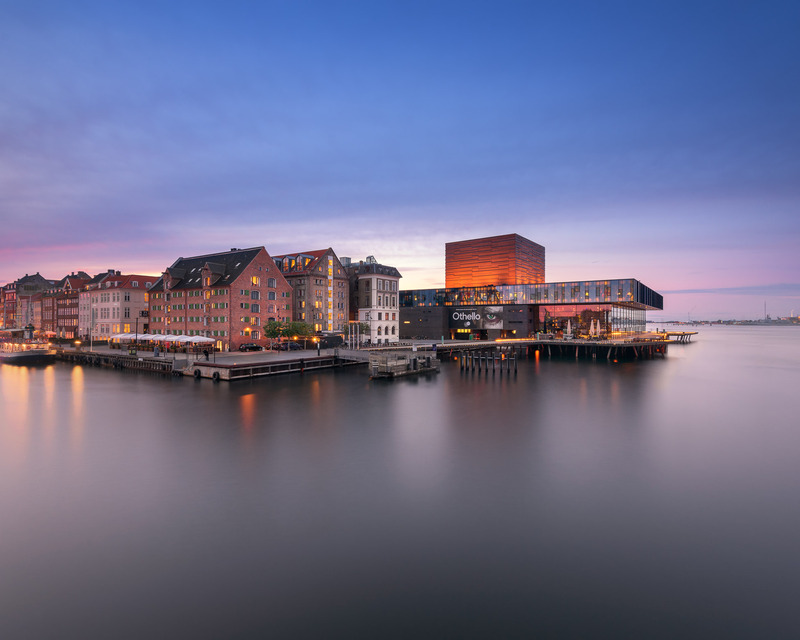 One of the newest and most significant developments in Copenhagen’s arts scene is the Royal Playhouse, a strikingly modern building that almost seems to levitate just over the waterfront. The building, which was just completed in 2008, is already considered an architectural masterpiece and is a designated City Landmark. It’s no wonder that the building is so highly regarded; the city began planning a building to replace the original playhouse in the late nineteenth century. Perched at the water’s edge, the playhouse’s blue-green glass shimmers with reflected water. I see it as a monument of sorts, but not only to the arts — to the Danes themselves, a people who would spend more than a century designing a theater.